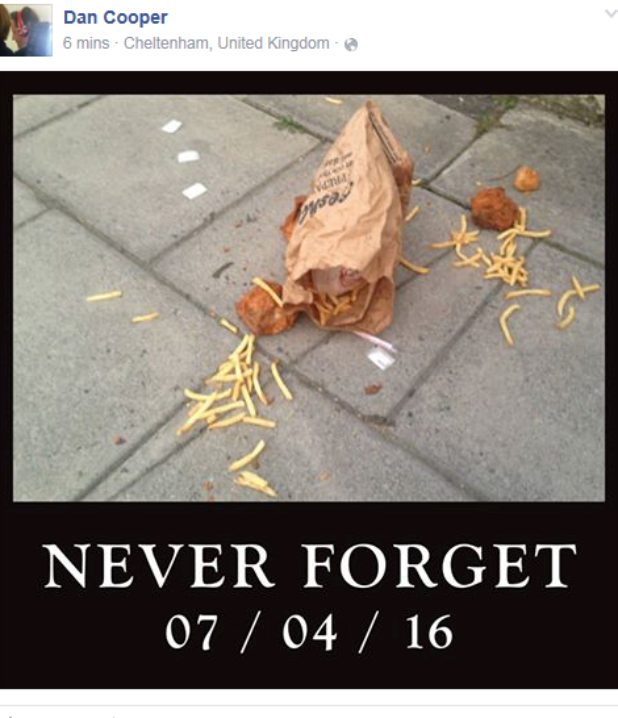 The nation is in mourning after tragic scenes in Cheltenham where a person or persons unknown dropped their entire KFC meal on the floor. The tragedy happened this morning in Cheltenham, quickly being reported upon by the Gloucestershire Echo. People all over the UK are mourning the tragedy. A journalist at the local Gloucestershire Echo spotted the meal this morning, strewn across Cheltenham's St George's Palace. The reporter then scoured the area and located a torn KFC carrier bag on a nearby street, which they believe to be related to the tragic incident. "It was strewn across the pavement at 6.30am and, as of then, hadn't been eaten by birds or foxes." They report. "Is it yours? If you can help reunite the chicken and chips with its owner, please do so." The newspaper are now on the hunt for the owner of the fried chicken, hoping to reunite the owner with their meal. Our thoughts are with the owner of the KFC at this difficult time.